Just when we thought Yellow Label Kids couldn’t make their rattles any cuter – they did. These new, adorable Animal Ring Rattles are the perfect size for little hands to grasp. Soft, safe and sweet, these handmade knit rattles, like all of Yellow Label Kids’ goodies, are made with Fair Trade practices. 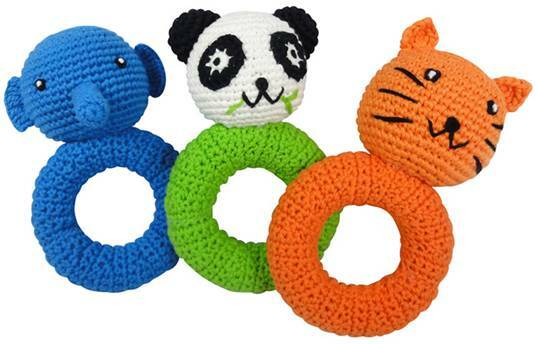 Animal Ring rattles include an elephant, panda and kitten – enough friends to go around at your next baby play date session. Just when we thought Yellow Label Kids couldn't make their rattles any cuter - they did. These new, adorable Animal Ring Rattles are the perfect size for little hands to grasp. Soft, safe and sweet, these handmade knit rattles, like all of Yellow Label Kids' goodies, are made with Fair Trade practices. Animal Ring rattles include an elephant, panda and kitten - enough friends to go around at your next baby play date session.